Sunday, January 5 1908 -- Herriman apparently can't settle on an idea for today's cartoon, so he gives us four, all stating the same point about the same subject. The point being that boxer Abe Attell's supremacy in the featherweight class, previously considered absolutely unassailable, has been shaken by this draw with the little Brit Owen Moran. 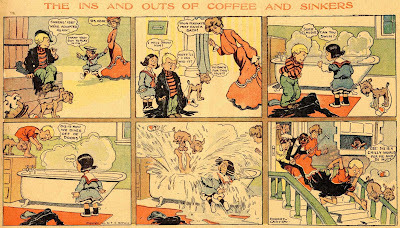 You wouldn't think that orphan children would exactly be a ripe subject for comedy, but there have been a number of comic strips that chronicle an orphan's quest to find new parents (or just a home to get them off the street!). I don't know if Coffee and Sinkers is the first of the genre, but I can't think of an earlier one. One thing I'll say for certain, though, is that hands down the funniest is Dwig's Home Wanted By a Baby. I'll cover that one of these days when I'm feeling very warm and indulgent toward y'all. 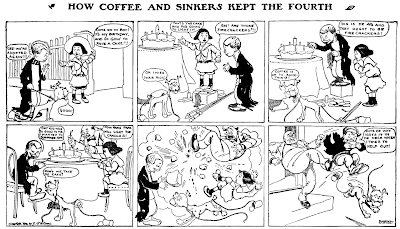 Coffee and Sinkers is a McClure Syndicate entry that ran from June 7 to July 26 1903. It was created by the great illustrator Robert Carter, who slummed in the Sunday funnies on a few occasions. Another of his series, Just Little Ones, uses something more akin to his straight illustration style. Oh, by the way, if you're not up on your semi-antiquated jargon, 'coffee and sinkers' is slang for cheap coffee and donuts. 'Sinkers' because if the donuts are overly dense or stale they'll sink to the bottom of the coffee cup when you dunk 'em. Mostly a Britishism, but apparently popular on our side of the pond a hundred years ago. Robert D. Carter was born in Chicago, Illinois in February 1875; the birth date is from the 1900 U.S. Federal Census. According to the 1880 census he was the fifth son of Consider and Emma; the family resided at 314 West Jackson Street in Chicago. Actually, Carter may have been in New York since the late 1890s. According to the 1900 census he married Hilda, in 1898, who immigrated from Austria in 1896. They had a son, Robert, and Carter's father lived with them at 95 Hart Street in Brooklyn. Carter's occupation was artist for a newspaper. In the 1910 census, Carter had remarried to Lilian who was born in California. They family of four lived at 566 Greene Avenue in Brooklyn, six blocks south of their previous residence. Carter was an artist for a newspaper. about a year ago, and done much to promote the Liberty Loan drives. This Just In ... Mystery Solved! You may recall that last week we ran some rare Sunday versions of Muggs McGinniss and High Pressure Pete, strips that were previously known only as dailies. We wondered why these 1931-copyrighted Sundays mysteriously appeared in the New York American of October 1 1933. Well, we have an answer to the mystery courtesy of research by Jeffrey Lindenblatt. He hoofed it down to the New York Public Library to see if he could solve the mystery, and by gum, he nailed it! First of all, he found that there are two additional High Pressure Pete Sundays that appeared in the October 8 and 15 sections (as alluded to by Grizedo in a response to the original post). Muggs McGinniss appeared only the one time. He also found that the American increased the page count of it's Sunday section from 14 pages on September 24 to 16 pages on October 1 and 8, and then to 20 pages on October 15. After that the page count was scaled back to 16. To fill the extra pages, they not only used those old Muggs McGinniss and High Pressure Pete strips, but also ran Buck Rogers and Joe Jinks starting on the 8th, and some regularly appearing strips that were usually run as halfs were run as full pages. But that leaves the central mystery -- why did the American suddenly increase its page count when they were obviously not well-prepared to fill that space? Lindenblatt has the answer to that, too. It was on October 1 that the New York Daily News, the American's main competitor, upped the page count on its Sunday section, adding the new features White Boy, On The Wing (soon renamed Smilin' Jack), Sweeney and Son, Little Joe and the new series of Teenie Weenies. The American had to try to keep up. Major kudos to Jeffrey Lindenblatt for solving this mystery! Is this just speculation, or did Lindenblatt find documentation that this was the case? Well, we don't have a interoffice memo saying so or anything like that, of course, but it is not coincidence when two major papers beef up their comic sections on the same day. The NY Hearst papers were DEATHLY afraid of the Daily News, which took a major bite out of their circulation from its first day of publication, and just kept siphoning off more seemingly every week. Make no mistake, the Hearst papers watched every move the News made and countered it as best they could. Let's put it this way. If I was a betting man, I'd bet the farm and my first-born that Lindenblatt has hit the nail on the head. I'd definitely agree with Allan, here. The Mirror was the Hearst organization's someone feeble response to the Daily News, and it never really took off, dying a somewhat quiet death in the early 60s. The emergence of the Daily News, in combination with radio and the depression, also probably was a factor in the merger of the Hearst New York papers the Journal and the American in the late 30s. I think at one point Hearst even tried to buy the Daily News, and was shot down for a number of reasons. Here's a challenge for you wordsmiths out there. For years I've been trying to come up with a term to describe a daily panel cartoon or comic strip that uses multiple recurring titles. You know the type I mean -- the Clare Briggs, H.T. Webster and Gluyas Williams features are the most famous examples of the genre. For instance, Briggs had in his arsenal When a Feller Needs a Friend, Real Folks at Home, It Happens in the Best Regulated Families, Ain't it a Grand and Glorious Felling and so on. None of these titles was a feature unto itself, they were each just used regularly on his otherwise untitled daily feature. Some purveyors of this type of feature would add and drop titles over the years, others stuck pretty much to the same ones, and others (T.E. Powers comes to mind) were like a shotgun, adding and dropping recurring titles constantly. I've called these 'revolving title' or 'multiple title' features, but those are certainly not terms that come trippingly off the tongue. I often wonder what term the creators themselves used, but in all my reading about the form I've never come across a pithy term for the genre. So does anyone know the proper term for these, or failing that, have a suggestion for a term that properly describes them and is elegant and succinct? Anyhow, while you're grinding your mental gears on that, take a look at this multiple revolving title (ugh!) 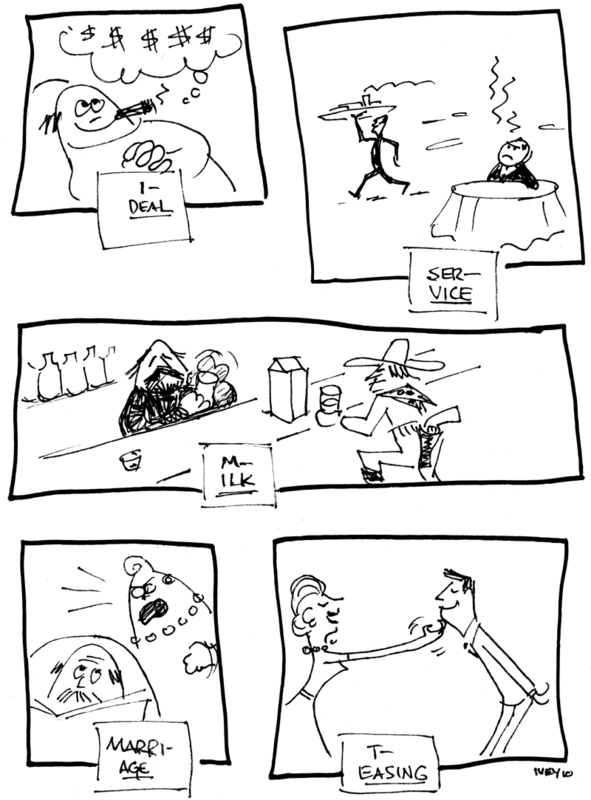 comic strip series by Milt Gross. Gross' short-running series boasted a mere three recurring titles -- The Meanest Man, I Did It and I'm Glad, and Draw Your Own Conclusion. Considering it ran for just six months I guess Gross didn't need to invest in more. When Milt Gross left Pulitzer's Press Publishing for Hearst's King Features around September 1930, he was faced with creating new strips to replace his then-current series; this daily-only strip was the successor to Looy Dot Dope. 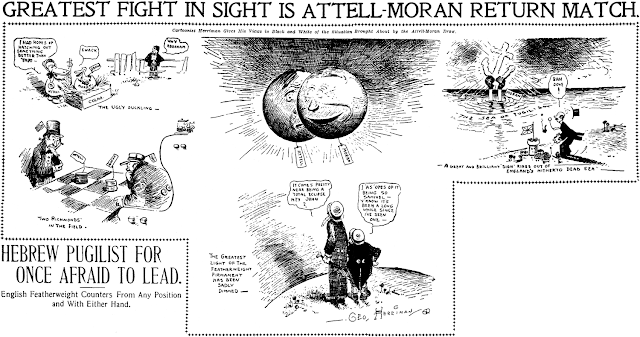 The new strip probably began on October 6 1930, though the Wisconsin News, one of the few papers to run it, ran it ROP, so that date could be a week or two off. 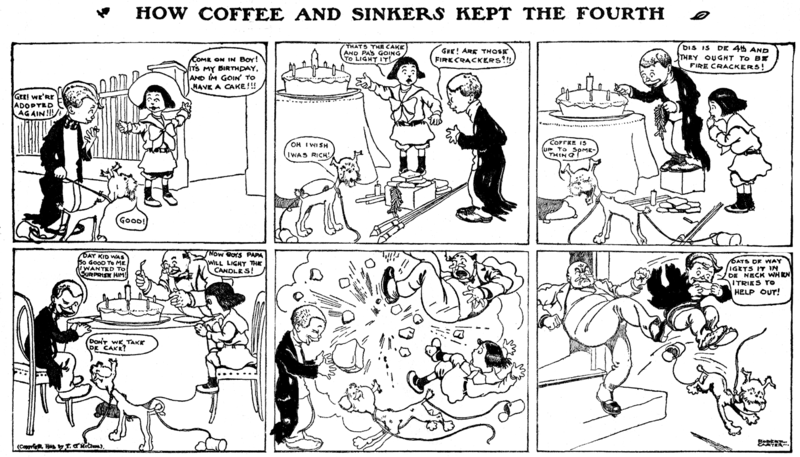 The strip ended on March 28 1931, replaced by Milt's new daily (and soon to be Sunday) series, Dave's Delicatessen. "Revolving title" don't seems so bad to me (but English is not my language...). When I first saw your very elegant suggestion, I just loved it. I may have even let out a little squeal of pleasure. But I was chastened when I read the dictionary definition and was reminded that the term 'anthology' is often used to imply a multiplicity of authors, and I decided that the last thing I want to do is be obfuscatory. Pity. I loved the origin of the word, too, which apparently was something to the effect of a bouquet of flowers. How nice. In the trade press, as well as newspaper's own use, these were always referred to with the author's name, as it would be enough to instantly tell the reader what to expect. Allan, this is the 21st century internet, what does the accepted correct definition have to do with anything? A polynomial strip? Technically correct, but rather confusing as it is normally used in mathematics. More correct and not used otherwise: a polyonymous strip. Polyonymous = "Having many names or titles." Polyonymous!!!! I love it! It'll send a lot of people running to the dictionary, but hey, that's their tough luck. Don't take Latin 101 and you pay the rest of your life. Herb "Hype" Igoe was primarily known as a sports writer, but he was also an excellent cartoonist. But rather than flap my gums about him, I refer you to Yesterday's Papers, which offers two biographical posts on the guy; part one and part two. Igoe concentrated primarily on his writing, but seldom let his drawing nibs migrate to the back reaches of his desk drawer. He contributed both serious and funny sports cartoons to the Hearst papers, and did quite a few spot illustrations, too. What he rarely did was draw a series of comic strips -- in fact he only did so once in his career that I know of (actually he has two series to his credit in the Guide listings, but the other was a panel cartoon). Here is Mr. Dwindle, that one series. It ran in the New York American from December 16 1909 to January 10 1910. It ran as a replacement for the vacationing Bud Fisher's Mutt and Jeff. Herbert Anthony Igoe was born in Santa Cruz, California on June 17, 1877; the birth date and middle name are from his World War I draft registration card. According to the 1880 U.S. Federal Census, Herbert was the oldest son of John and [Mary] Catherine; the census enumerator wrote his name as Albert. The family lived in Santa Cruz, California. The census listed a younger brother, John, who died at an early age as he is not listed in the 1900 census. According to the web site, Artist Finder, "Igoe studied art under Maria Van Vleck while a student at Polytechnic High School in San Francisco and continued at the Mark Hopkins Art Institute." "Igoe started his newspaper career at 15  as a copyboy on the San Francisco Examiner" according to The Troy Record (New York), February 12, 1945. In the 1900 cenus the Igoe family lived in San Francisco at 337 Tenth Street. Herbert was an artist at a newspaper. On June 26, 1930, the Nevada State Journal published the column, "Old Timer Says—," which was about Herbert. According to the column, he married Florence Edmundson in June 1905 and they went to Lake Tahoe for their honeymoon. On February 12, 1945 the San Mateo Times (California) reported that "He came to New York in 1907 and joined the staff of the World, remaining there for 19 years until he joined the New York American, now the Journal-American, in 1926." In 1910 Herbert lived with his wife, son and servant at 4241 Broadway in Manhattan; he was an artist at a newspaper. He signed his World War I draft card on September 12, 1918. On the card he said he was a newspaper writer at "The World" and resided in Brooklyn. His description was medium height and build with brown eyes and black hair. In 1930 Herbert had remarried, around 1920, and resided in Queens, New York at 3552 222nd Street. With him was his second wife, Katherine, daughters Juanita and Gloria, his mother and a servant. He was a writer at a newspaper. Herbert passed away on February 11, 1945. The San Mateo Times reported that he "had been suffering from a heart ailment and last July obtained a leave of absence from the Journal-American. He had been in a hospital since January 22." I have found what I think to be an original sketch of Joe DiMaggio from Herb Igoe. I would love to get your opinion on it but it doesn't look as if I can post a picture of it..